Brooks Resources Corporation’s annual wall calendar has graced the walls of Central Oregon businesses and homes for nearly four decades. Featuring beautiful scenes from our region, this year is no different. For 2019, the horizontal format calendar features an expansive view of the three Sisters mountains. Local photographer Mike Houska of DogLeg Studios took the photo from beloved resort Black Butte Ranch, developed by the company nearly five decades ago. 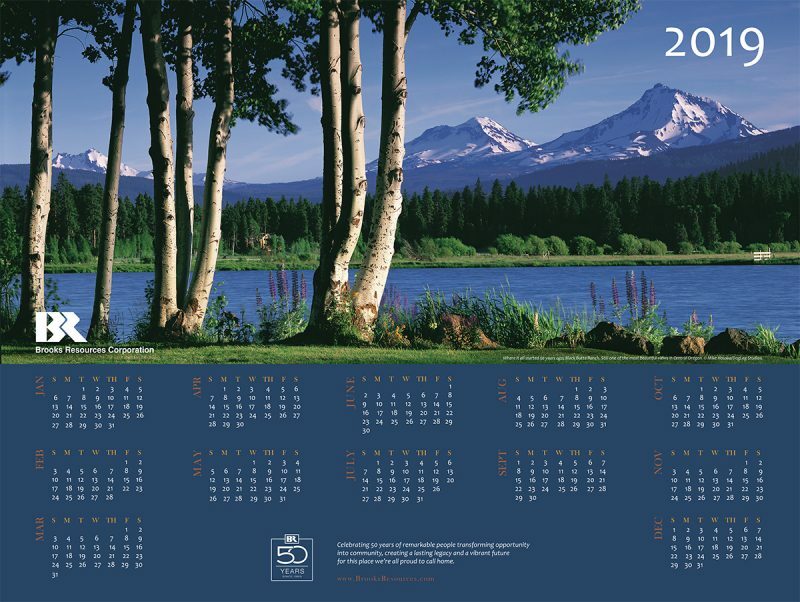 Calendars are available at the Brooks Resources corporate office in downtown Bend, Oregon at 409 NW Franklin in downtown Bend. As always, the calendars are free to the public and can be picked up from 8 a.m. to 5 p.m. on all business days. Thousands of the calendars are being distributed to local businesses by non-profit group Abilitree in exchange for a donation from Brooks Resources. Abilitree empowers people with disabilities to grow their independence, productivity and inclusion in community life by providing them with resources and employment. This entry was posted in 50th Anniversary, News & Events, Supporting our Community. Bookmark the permalink.